Lightsmith is the trademark and marketing arm of Jefferson Lighting and Brassworks, Inc. Our original company was named after Thomas Jefferson, a man we admire very much and who was also an occasional citizen of our Lynchburg area as he got older. His octagonal summer home, Poplar Forest, is just a few miles from our shop. All of our church lights are and will continue to be named after people and places in the life of Thomas Jefferson. Lightsmith is an international supplier of specification-grade church, custom, and architectural lighting. From our humble roots as a church lighting manufacturer (Jefferson Lighting), we have grown to be one of the most respected names in the custom and architectural lighting field. 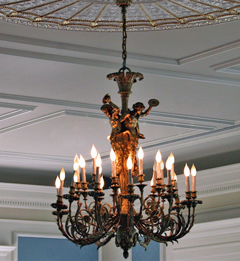 Lightsmith's lighting products and lighting restoration services are some of the most sought after in the industry. For architects dealing in classical historic lighting restoration and preservation, to church lighting retrofits, to schools and universities looking for large-scale custom lighting to give their alumnae and students a focal point of pride and inspiration, we are there with hammer in hand ready to forge light on the anvil of imagination. Over the years, our shop has renovated, restored, and duplicated thousands of fixtures in multiple state capitals and government buildings. We hold the record at this point in time for the largest single lighting restoration job ever contracted by the United States Government.